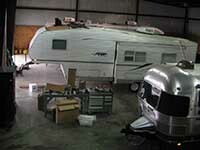 Our RV technicians and mechanics are experts at making sure your motorhome is in great shape for your next trip. We offer preventative maintenance and regularly scheduled maintenance services for both chassis and house systems. 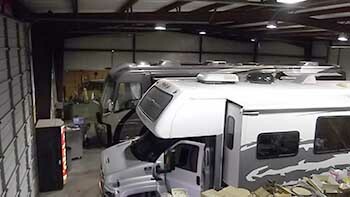 Call us today at 830-627-3030 to discuss your RV’s maintenance requirements with an expert. The best way to keep your coach running well is keeping up with regularly scheduled maintenance. Our RV experts can inspect your chassis and help you determine what services your coach needs based on condition, year, and how you use your motorhome. When you can’t plug in to shore power, it’s important that your generator is always ready to power your house systems and appliances. Just like your main engine, your generator needs regular maintenance in order to perform well. We are a certified Onan generator service center. Maintaining your motorhome’s roof is one of the most important things you can do to protect your investment. As seals around vents, fans, and other roof items begin to age, dry out, and crack – they lose their ability to keep water out. Keeping your roof inspected and water-tight can save you thousands of dollars in future water damage repairs.